Maybe that’s partly why I prefer Susan now, Sue having fallen short in so many ways for so long. Like many mother/daughter relationships, ours has been fraught with issues and challenges (as well as joy and happiness) about which I blogged on Mother’s Day 2012. So, it’s curious that the one “Oh Sue” I remember most specifically isn’t a criticism, but a little cheer. And I hear it as clearly today as I did forty-four years ago across a riding ring one late-summer afternoon. 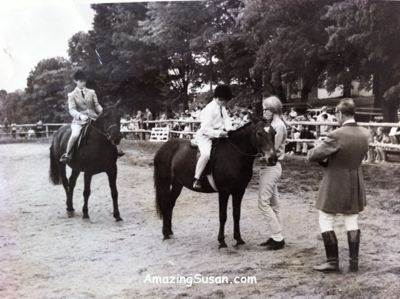 During that awkward leaving-girlhood time, Mom drove me once a week, from July 1st to the end of August, to the Pony Club in Knowlton for riding lessons. She also drove me crazy. As I’m sure I did her. I don’t remember much of those 90-minutes-to-Knowlton drives, but I can still taste the dust our mounts kicked up as we walked, trotted, and cantered round the riding ring. Our instructor, Fiona, stood at the center barking commands in her proper English accent, while we, a dozen or so horse-crazed pre-teens, submitted to the ordeal with dogged determination. We shouted alphabetical horse body parts as we rode, and tried to keep our seats at the same time. Some of us were less successful than others, thus the need for hard hats. All the while, Mom leaned on the fence watching, head propped on crossed forearms, one foot up on the bottom rail. She must have been hot, tired, sweaty, and thirsty (I know I was! ), but she never complained. That was my job. When our riding time was done, the post-lesson tack cleaning often brought out the cranky in me. When it did, Mom took me to a little greasy spoon for lunch on the way home. It had a screen door that clanked shut, and an old-style ceiling fan that wasn’t of much use, even on only warmish days. We’d have hamburgers, French fries and strawberry milkshakes. Just thinking about it now makes me slightly queasy. I imagine I got carsick more than once as we drove back. Each Pony Club summer ended in grand style with a one-day “Horse Show.” Bleachers sprang up at one end of the rectangular ring. Parents crowded into them. Others brought their own ringside seats. Mom opted for her usual place on the fence. The first year, when my beginners’ class was announced, I trotted, or rather Tavi, my favourite Pony Club pony trotted I astride him into the ring. I felt all grown up as well as nervous competing in my first official equestrian event. I remembered to keep my hands soft, my heels down, and my eyes focused on where I wanted to go. I didn’t know it then, but I surely know it now: those basic skills apply as much to life as they do to horseback riding. We went round and round, as we did during our lessons, but instead of filing out at the end we lined up in the middle of the ring. Just like in a dog show, four or five of us would be invited to make a couple of last laps to help the judge finalize her first-, second-, and third-place choices. I looked straight ahead, heart beating fast, hopeful. Three of my co-competitors had already been chosen. My face turned tomato red. Somehow I managed to squeeze my knees gently to urge Tavi on from a standstill. “Oh Mom!” I thought to myself as we got underway. “How embarrassing! Calling my name like that in front of everyone! How could you?” I buried my humiliation in my concentration. “Keep your legs still, seat firm in the saddle, fingers like sponges around the reins,” I reminded myself. After a few circuits, we were back in the middle, five finalists each hoping for first place. There was a hushed expectancy in the air. I held my breath; it held me back, stiffly. This time, there was no singleton cheer from the peanut gallery. Somehow she must have sensed my embarrassment the first time around. But I could see her, out of the corner of my eye, one hand clapped firmly over her mouth, the other waving high and wild. She was jumping up and down. Oh God. Tavi walked forward, and I collected my prize. I don’t think I’d ever won anything before. Some unknown photographer captured the moment, and the resulting image is one of only a dozen or so pasted in my pre-teen scrapbook. I look all business for such a little girl. Subscribe to my stories and blog posts here.